One Sun. Two ways to ride. It’s not a Ferris Wheel. It’s the Sun Wheel. 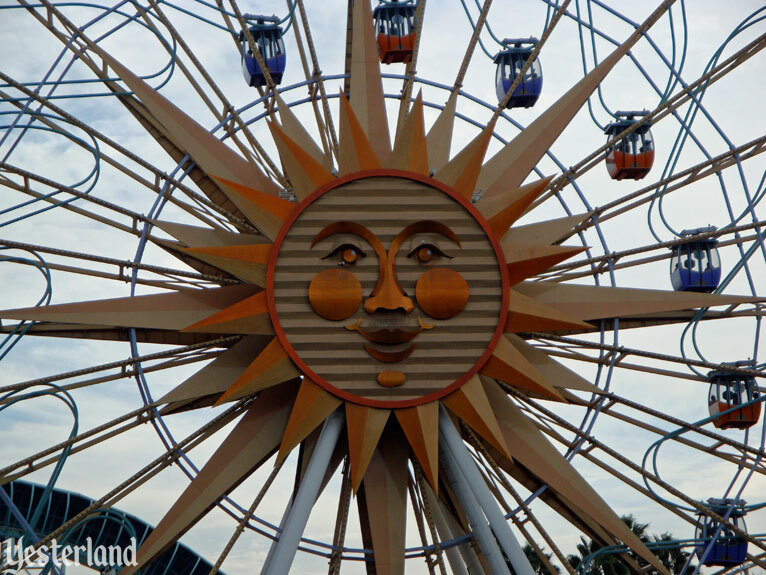 The California Sun smiles at you from the center of the 160-foot diameter amusement wheel. 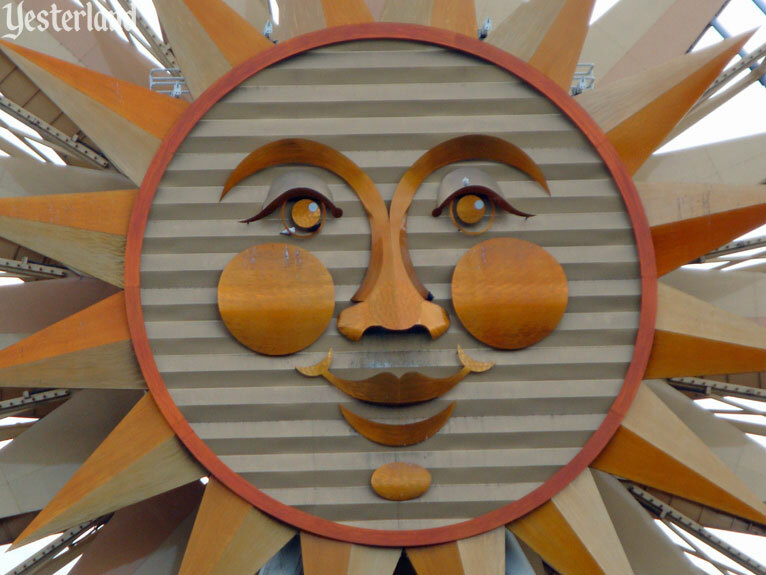 The sun face looks like ornamental art from the 1970s, influenced by Mexican folk art—just really big. The California Sun remains stationary as the ride rotates behind it. 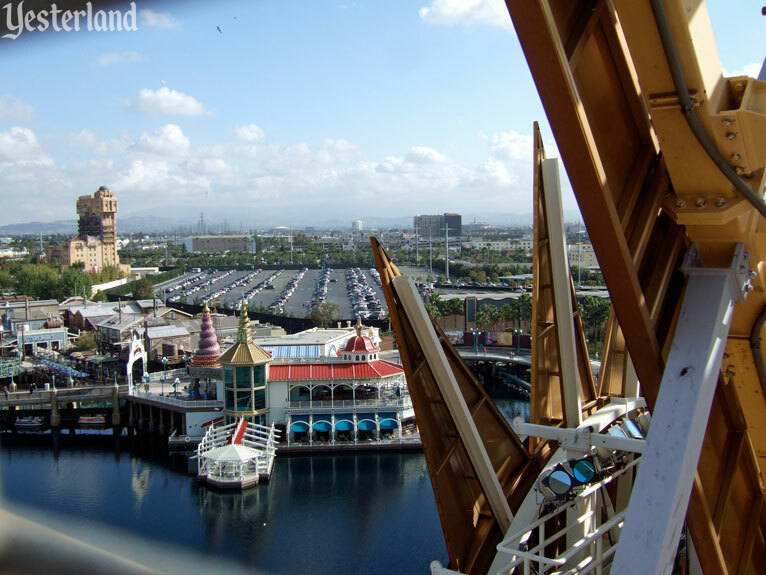 Before you board the Sun Wheel, you’ll have to decide if you want a tame, conventional Ferris Wheel ride or a thrilling ride in a gondola that moves and swings. You’ve arrived at the entrance to the Sun Wheel. 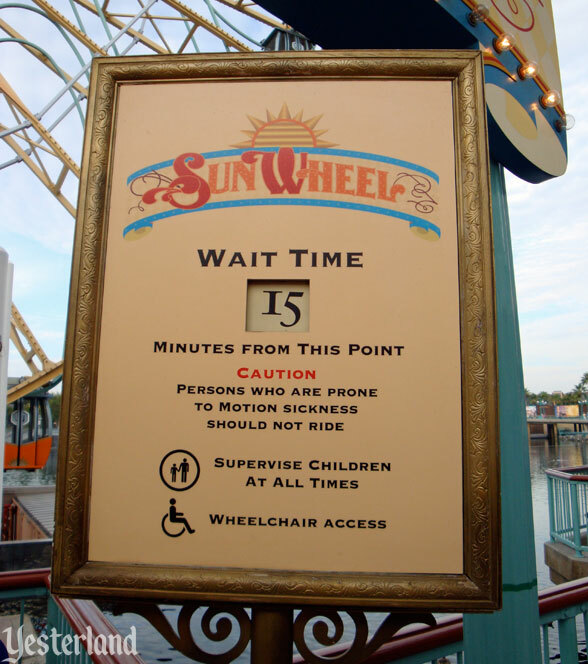 Don’t worry about the wait time sign. It probably will take much less than 15 minutes. The wait time may not be real, but the caution notice is. There are even motion sickness bags in the swinging gondolas. The queue is below sea level—actually below Paradise Pier Lagoon level. 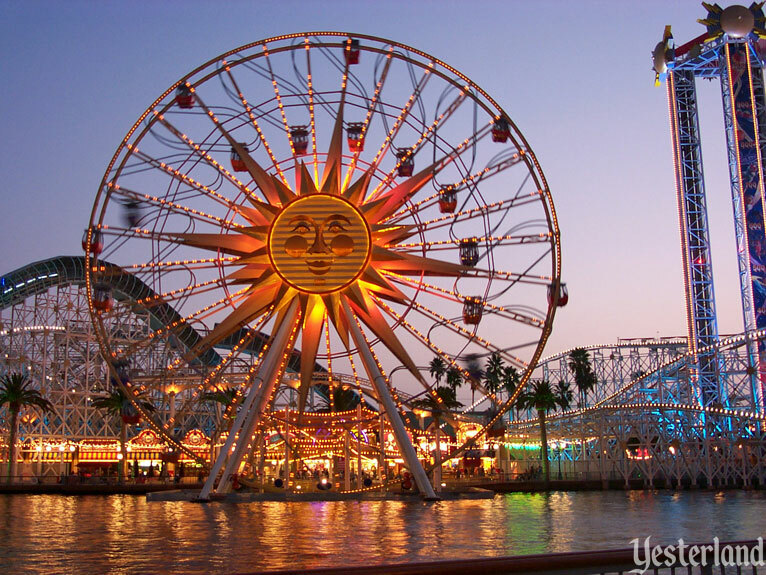 Paradise Pier’s Sun Wheel takes Guests on a Ferris wheel-ride high above Disney’s California Adventure™ park. You can play it a bit safer by riding one of the cool stationary gondolas; or for a real thrill, climb into one of the purple-and-orange gondolas, which ride on interior rails so they slide inward and outward with the centrifugal force of the wheel’s rotational movement! 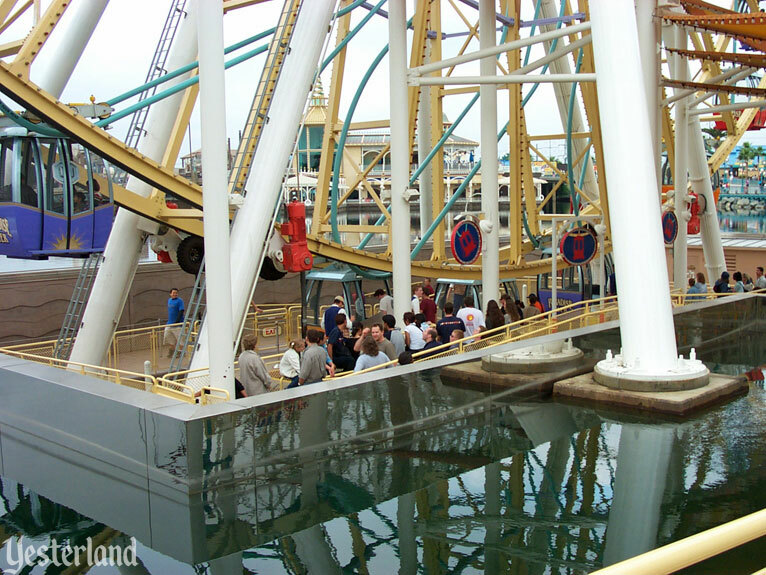 Well, the gondolas actual slide in and out (and swing back and forth) because of gravity, not centrifugal force. Enjoy a view as as your gondola makes the full circle. Maybe you can spot your car in the Timon parking lot. 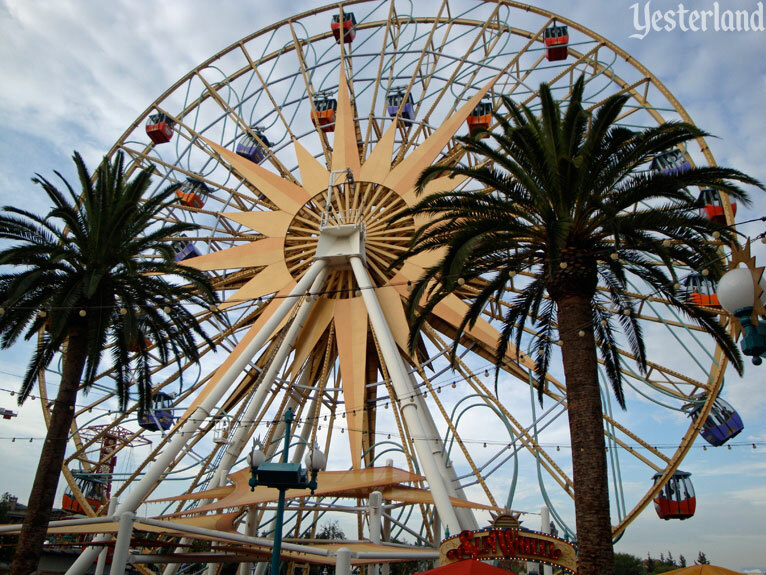 Although the Sun Wheel is now in Yester California Adventure, for all practical purposes it’s really not gone from Disney California Adventure. California really did have amusement parks up and down the coast in the early 20th century. 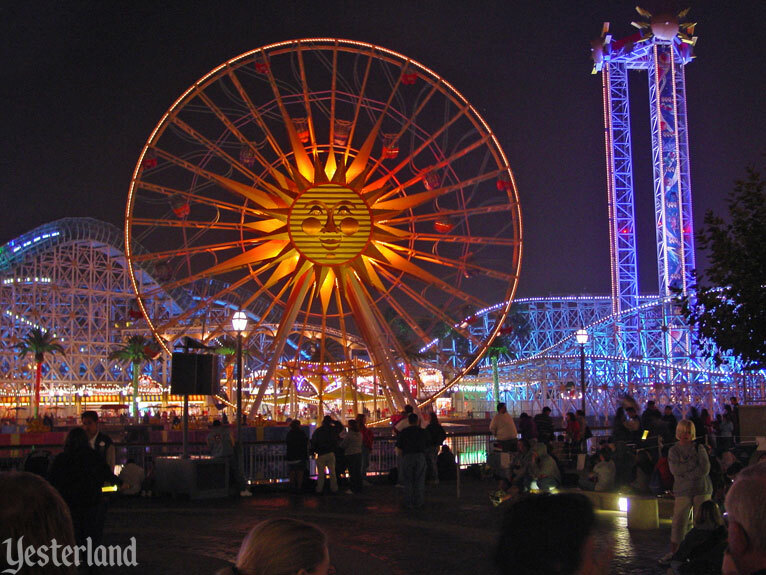 A few are still around, such as the Santa Cruz Beach Boardwalk and Belmont Park in San Diego. 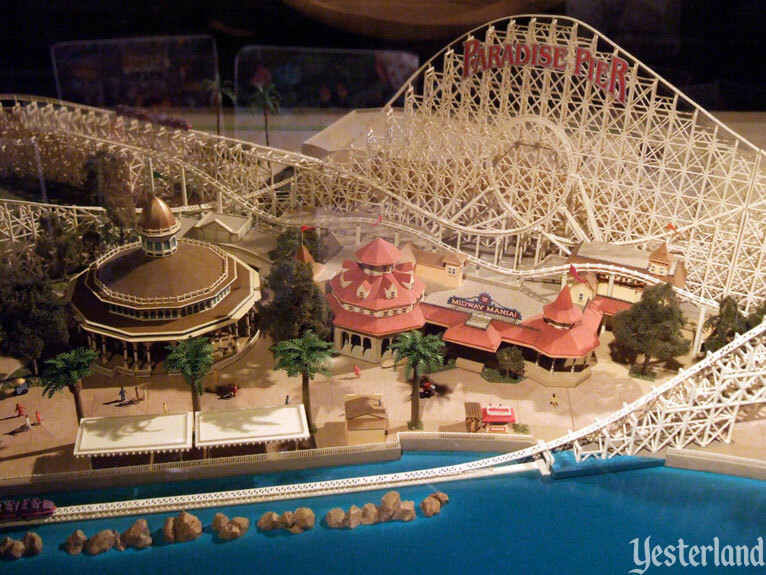 Most are gone, including Playland at the Beach in San Francisco, Venice Amusement Pier in Venice, Ocean Park Pier in Santa Monica, the Pike in Long Beach (not to be confused with today’s Pike at Rainbow Harbor in Long Beach), the Joy Zone in Seal Beach, and many others. 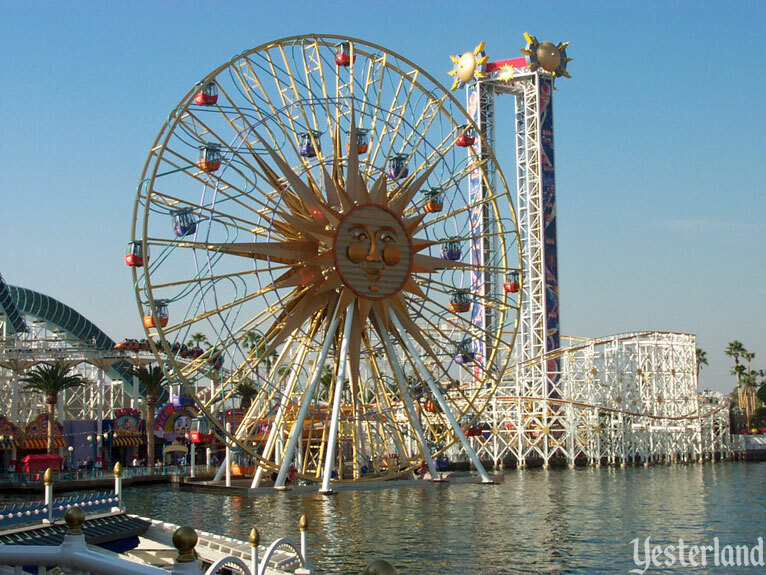 Based on the overall theme of Disney California Adventure, it would be easy to think that the Sun Wheel was based on an actual ride at a California seaside amusement park. It’s the Wonder Wheel, not the Sun Wheel. It turns out that the Sun Wheel was actually a rather faithful copy of the historic Wonder Wheel ride at Deno’s Wonder Wheel Amusement Park at Coney Island in Brooklyn, New York. The Wonder Wheel is still operating. It was named an Official New York City Landmark in 1989. Built in 1920 by the Eccentric Ferris Wheel Company using 100% Bethlehem Steel forged right on the premises. The 18 co-owners worked as construction men to insure quality throughout the building process. The Wonder Wheel has maintained a perfect safety record for its entire history. Each year, the entire 400,000 lb. ride is overhauled and painted to protect it from the elements of weather, wear and tear. Just like the Disney version, the original has sixteen swinging gondolas that slide around tracks as the wheel rotates and eight stationary gondolas. 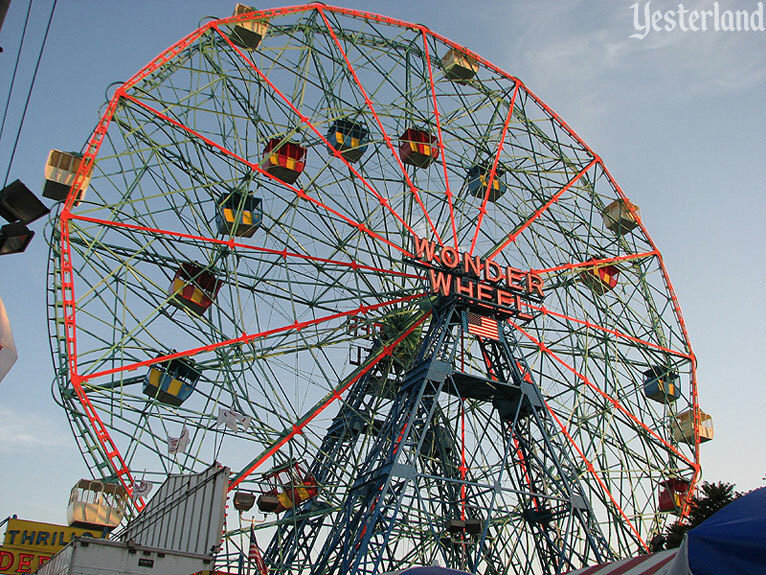 The Wonder Wheel has a diameter of 135 feet, while the slightly larger Sun Wheel has a diameter of 160 feet. There is no sun face on the Wonder Wheel. And there’s no sun face on the Sun Wheel either. 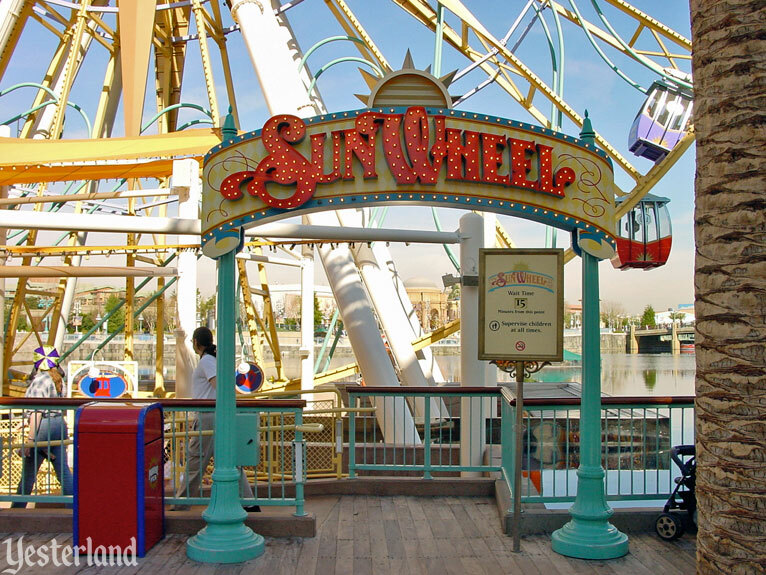 The Sun Wheel closed in mid-October 2008 for a half-year makeover to become Mickey’s Fun Wheel in May 2009. 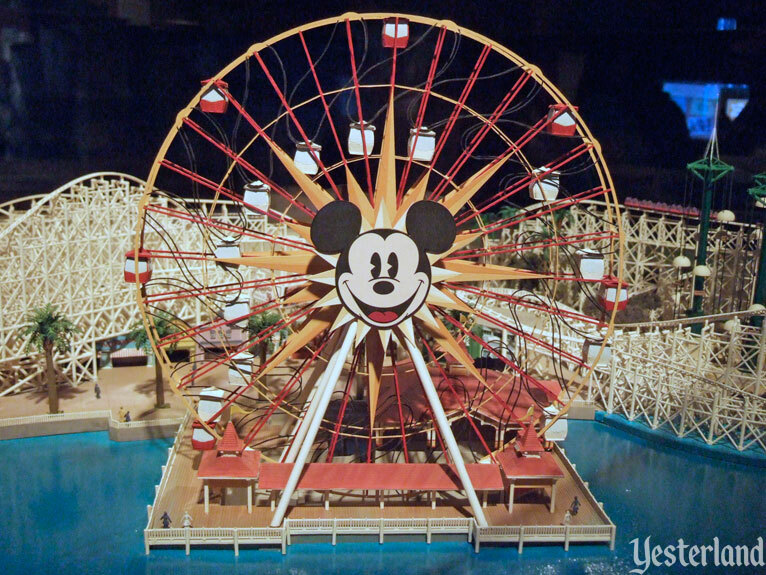 During the transition, guests visiting the Blue Sky Cellar in the former Seasons of the Vine building could see artwork and models of Mickey’s Fun Wheel. The new colors would be red, yellow, black, and white—the classic Mickey Mouse colors. 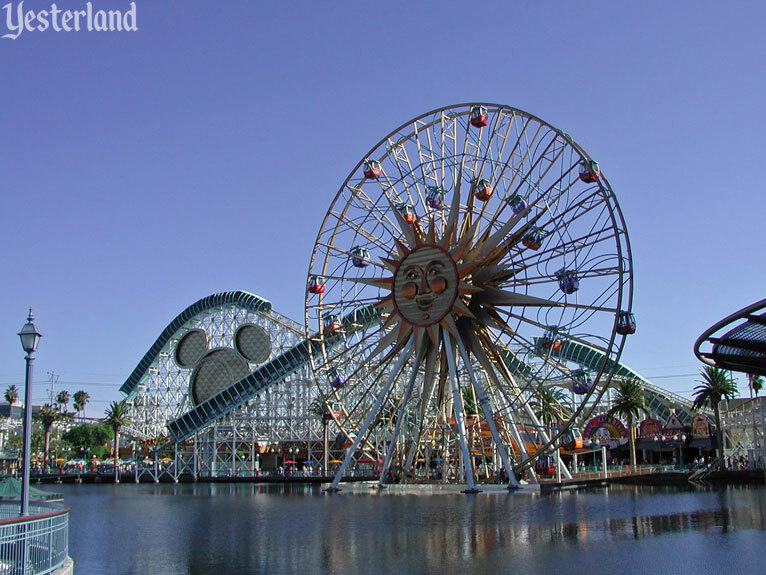 In the center, a friendly, pie-eyed Mickey Mouse face would replace the California Sun. It’s a Mickey Mouse cartoon! 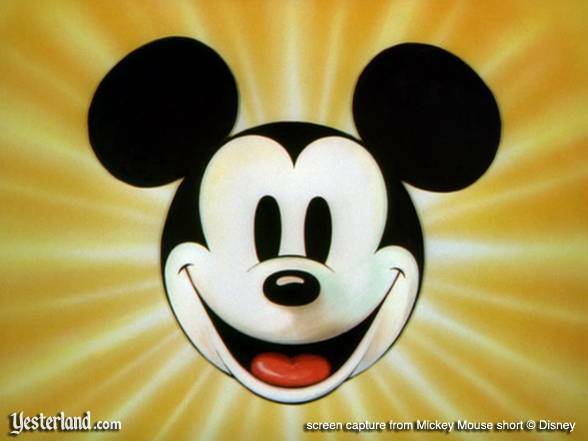 The Mickey Mouse face is instantly recognizable from the opening frames of Walt Disney’s Mickey Mouse color cartoon short subjects. Okay, that version of Mickey wasn’t pie-eyed—but today we associate those pie eyes with the vintage Mickey Mouse. While Mickey Mouse isn’t really turn-of-the-century, the nostalgic character from 1928 is a good fit for a nostalgic seaside amusement park of the early 20th century. 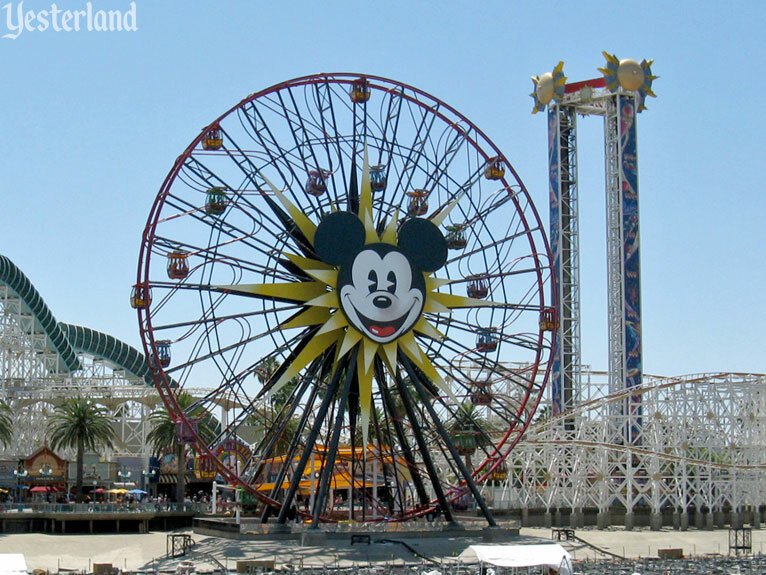 When Paradise Pier originally opened, there was a Mickey Mouse head on the California Screamin’ roller coaster. It was a modern, almost industrial-looking Mickey Mouse symbol, not a friendly face. Presumably, the Mickey head symbol was supposed to draw attention to the loop. The stark, modern symbol looked turn-of-the-millennium (2000), not turn-of-the-century (1900). The Imagineers took care of that. The loop is no longer a Mickey Mouse symbol. There’s now a Paradise Pier sign in lettering appropriate to the early 20th century at the crest of the highest roller coaster hill. As far as the ride experiences go, Mickey’s Fun Wheel and California Screamin’ are about the same as the original 2001 versions of those rides. The changes are cosmetic. 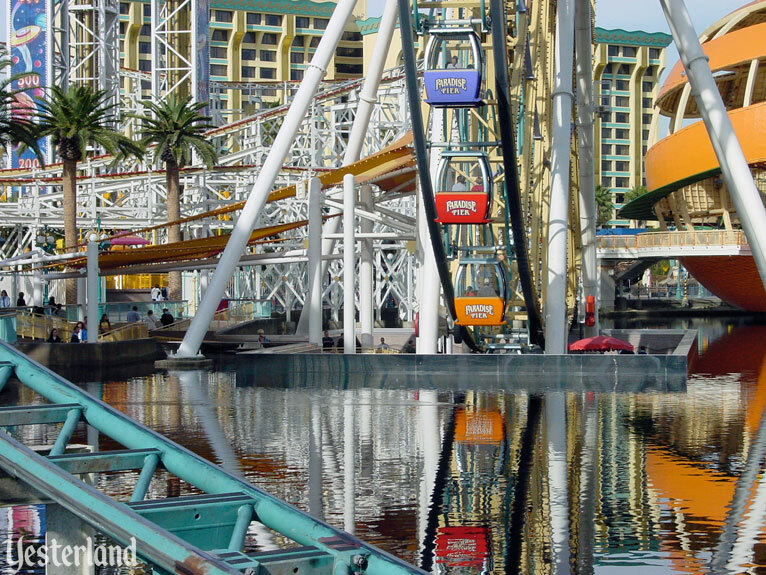 However, the overall atmosphere of Paradise Pier is much better after these changes. 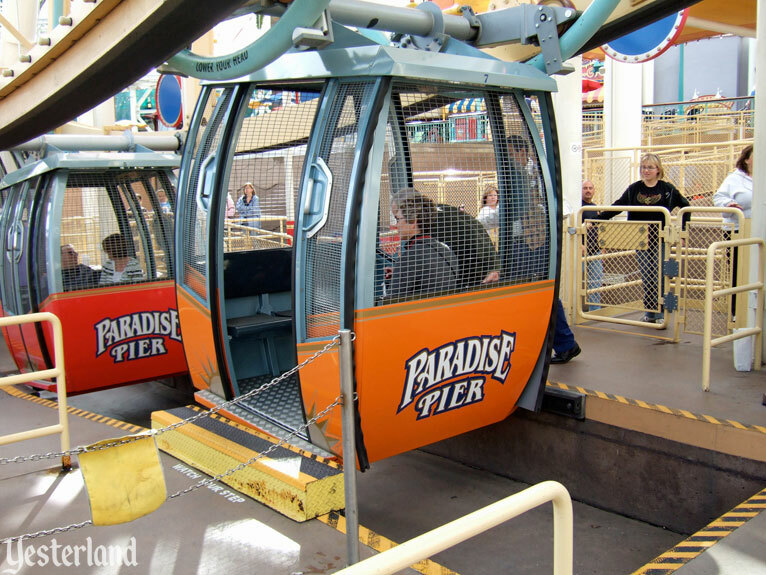 More enhancements are still needed so that Paradise Pier will deliver what it promised.